With its grand buildings, swanky hotels and riverside location Shamian Island has established itself as Guangzhou's main tourist area. 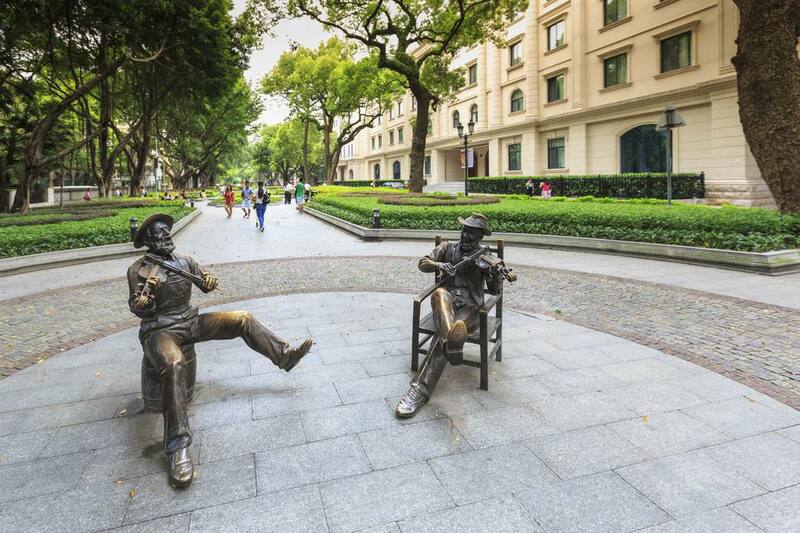 This well preserved colonial district with its period architecture, tree-lined avenues, and laidback appeal offers a break from the mayhem and futuristic developments of downtown Guangzhou. Throw in some fine restaurants and al fresco river sidebars and a trip to the island is a fantastic way to while away half a day. It’s not pretty. While the island itself is tranquil its history is far from it. After peppering the country with cannon balls over two Opium Wars it was Shamian Island that the British government squeezed out of the Chinese Emperor as spoils of war. In a country that was previously completely closed to foreigners, the island would be a base from where Britain, France and other colonial powers would be free to set up the base and import opium to sell on to locals. These days we call it a drug den — then they called it free trade. One of the many rules the new foreign traders had to adhere to was to not leave the island — they were restricted to Shamian and could only interact with members of the local cartel appointed by the Chinese government. It was rarely smooth sailing and the officials and the traders often clashed, including an infamous raid where millions of pounds worth of opium were dumped into the sea. The traders would ultimately move off the island when the British blackmailed a more secure base for their opium operations in nearby Hong Kong. It’s estimated of the 150 odd buildings on Shamian Island more than a third were built during the island's 19th-century colonial period. Set on a sandbar the island is just 1km long and less than half that size wide, making it an easy place to explore and enjoy on foot. Much of the attraction is walking the peaceful, tree-lined streets soaking up the atmosphere and admiring the sturdy Victorian houses, wrought iron gates and generous gardens where Englishmen abroad could once pretend they were in the Sussex countryside. There are a couple of specific sights worth seeking out. The French Catholic Church of Our Lady of Lourdes is a small, narrow church with pastel coasted walls and French inscriptions that still has plenty of Gallic charm. Naturally, the British built their own Anglican church, Christ Church, at the other end of the island and its solid walls and simple design would not look out of place in an English village. Many of the island’s most impressive buildings are former consulates of the colonial powers and are marked out with plaques. One site not related to colonialism — and that will be apparent on approach from the brutalist appearance — is the White Swan Hotel. During communism, this was one of the only hotels in town open to foreigners and the White Swan was later made famous by visiting Americans who would base themselves here when adopting Chinese children. Adoption rates have dropped, although you will still see the odd prospective parent camped in the cafe pouring over complex paperwork. The White Swan’s major claim to fame is its lobby. The owners have essentially transplanted a tropical garden inside the lobby with palm trees lined up around a waterfall and pool and balconies dressed and draped with greenery. Take the Guangzhou subway line 1 and get off at Huangsha Station. The island is a short 10-minute walk.